The SEC whistleblower program has enormous potential to help the government to prevent frauds from happening, identify and stop ongoing frauds earlier, save people from being victimized, and recover investors’ losses. And, of course, to grant monetary awards to SEC whistleblowers, sometimes quite large awards of millions or even tens of millions of dollars. All of which is great, but it begs the question: does the program actually work? To answer this question requires reference to SEC whistleblower program statistics. Publicly available SEC whistleblower program statistics go back to the fiscal year 2012, the first year for which the SEC has full-year data. Toward the end of each year, the SEC publishes a lengthy document called an “Annual Report To Congress On The Dodd-Frank Whistleblower Program” (the “Annual Report”). This is the report in which the SEC formally provides its SEC whistleblower program statistics to Congress each year. The SEC typically posts its Annual Report on its website, making it available to the public. The SEC’s Annual Report to Congress is a valuable resource for hard statistics on the SEC whistleblower program. In addition to the SEC’s Annual Report, there are occasional studies put out by outside organizations analyzing historical data about or relating to whistleblowers. Sometimes these are studies issued by educational institutions. Other times they may be position papers published by public service organizations, not-for-profits, or “public” think-tanks. On occasion, a private company or consulting firm, or an industry group, may put out either a commissioned or non-commissioned report. When reviewing these kinds of resources, a reader should consider who the authors are, what their interests or motivations were in putting out the report, and whether or how that might have influenced the conclusions they put forth. It can be difficult to obtain current SEC whistleblower program statistics in “real-time”. This is in part because (1) the SEC keeps its ongoing investigations confidential, (2) under the SEC whistleblower statute the SEC is required to keep SEC whistleblowers’ identities and information confidential (with certain exceptions), and (3) the SEC aggregates its statistics throughout the year and only releases most of them publicly at one time in its Annual Report to Congress. There are, however, certain miscellaneous materials that are released in “real-time” or near real-time. Some of them may require a bit of analysis or interpretation on the part of the reader, though. For example, on the SEC’s website is a page that lists the “Top 10 Awards” given out under the SEC whistleblower program. That list is organized by date, with dollar amounts listed for each of the Top 10 awards. It appears that this list may be updated within days or weeks of a new award making the list. The SEC’s website has another page that lists by date the whistleblower awards that it has granted, as well as the award applications that it has denied. Award grants and denials seem to be added to this list on the same day as each final determination is made, or within a few days thereafter. Occasionally, SEC officials may comment on the SEC whistleblower program. These comments may be made in SEC press releases, speeches at conferences or to trade or industry groups, testimony before the U.S. Congress, or in other forums. Sometimes the SEC officials provide statistics in their remarks. Other times they may use adjectives that, while subject to interpretation, may nevertheless provide insights into current trends or current ways of thinking. Records set for SEC Whistleblower awards, tips (2018 Annual Report to Congress). 2016 Annual Report to Congress on the SEC whistleblower program. Over $57 million in awards sets SEC whistleblower program record for a single year. 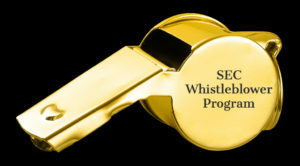 SEC whistleblower program exceeds $100 million in awards granted to date.